Don't let computer issues slow you down. Turn to Computers R Us in Jacksonville, Florida, for all of your computer service needs. Our PC experts can help you repair your PC or custom build your next computer. Best of all, we offer these services with the best prices in the industry. Contact us today to learn more! To complement our computer sales and repair services, Computers R Us is an authorized dealer for Clearwire® Internet services. All of our PC technicians are certified and educated professionals, with more than 30 collective years of quality PC experience. When you choose us, you will receive a 1-month guarantee on your service. We will work with you to assure you are satisfied with your purchase. This includes new laptops and custom PCs. 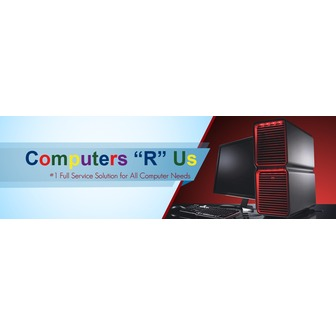 Computers R Us is an expert in helping you find what you need for your home or business office. No matter what your PC budget and taste may be, our computer store has exactly what you need. We offer a wide range of products including refurbished, new, and used computers. In addition to this we also offer affordable computer accessories including printers, monitors, mice, and keyboards. If you don't see the exact computer to fit your needs in our store, we will order or build one tailored to your desire. Don't let your old PC waste away. We buy and trade used or refurbished computers. For this, we also offer exclusive pricing on all Microsoft Windows® operating systems, ranging from Windows Vista® to Windows 8®. Please contact us for more information on products, current promotions, and custom options. If you are looking to sell your old PC, we are ready to buy used laptops and desktops from 2007 and later. We prefer the computer to be fully functional, but will consider purchasing non-functional PCs on a case-by-case basis. Let us take a look at your PC today and see what we can offer you. Computers R Us excels in building brand new systems from scratch using our custom box builds. For this, we offer a wide range of computer parts and components to suit your technical needs as well as a wide variety of desktop PCs. We have all types of desktops including high and low end builds. These are available in both new and used conditions. We also carry laptops of all brands and sizes. Contact us today to learn more! Is your computer slowing you down? Computers R Us in Jacksonville, Florida, is proud to be your source for computer repair services. If your PC is making weird noise, displaying a blue screen, or showing an error message, don't ignore it. Bring your computer to us. Our computer service technicians are experts in computer diagnostics, virus removal, and PC repair. Don't be afraid of that virus that has crept into your computer. Our expert staff can target remove viruses and restore your computer to 100% efficiency. Computers R Us has the most competitive and the most affordable rates in Jacksonville and surrounding areas. That's why we are known as Jacksonville, Florida's #1 stop for all of your computer needs.